Alec Bradley American Classic Blend is a hand-rolled premium cigar infused with mature tobacco leaves from Honduras and Nicaragua. What make these premium cigars so unique, is the silky, golden brown Connecticut-seed Honduran wrapper that holds together the fine robust tobaccos inside every Alec Bradley American Classic Blend cigar. The smoke is medium bodied and highly fragrant with smooth savory notes that are creamy and complex from start to finish producing a great ash and burn. 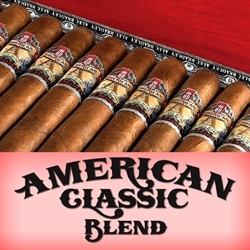 Alec Bradley American Classic Blend is a “classic” everyday smoke. Stock up your humidors with these masterpiece hand-rolled cigars. Smokers Discounts can bring these premium cigars right to your front doorstep. We’ve made it easy and affordable to buy cigars online. A variety of sizes and flavors are listed below. Each of these styles are in stock and available for a low discount price! Call us for more details!